This amazing version of Led Zeppelin’s iconic rock anthem “Kashmir” was arranged, performed and recorded by Ben “Uke” Rouse of the UK. Ben hit the Cigar Box Guitar scene fairly recently (he started playing one just a couple of days before making this video), but he has been a professional ukulele and mandolin player for years, and as you can see he has taken right to the CBG! See his FaceBook page here. Also check out his YouTube channel and website: www.benukulele.com. 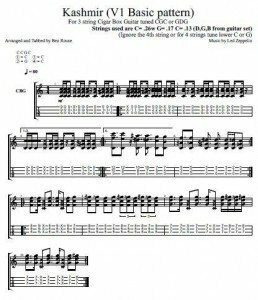 The tablature below shows you how to play one of Led Zeppelin’s most popular and enduring songs, Kashmir. what Ben is playing in the video above. This tablature may look more complicated than a lot of what we post, but don’t be scared! It shows both the standard notation (the musical notes) and the tablature. If the music notes don’t mean anything to you, just ignore them and focus on the tablature. Though the tab shows a 4th string present on the guitar, you can just ignore that too and focus on the top three strings/lines. This tab can be played on any Open tuning 1-5-1 instrument (GDG, CGC, DAD, etc). This tablature is shared here with the permission of the creator, and may not be used for commercial purposes. All rights to the original song Kashmir are the property of the respective copyright holders. This tablature is presented here for educational purposes only.